The Medieval French Jacket is an authentic looking and rugged medieval-styled garment that is well-suited for real-world use. 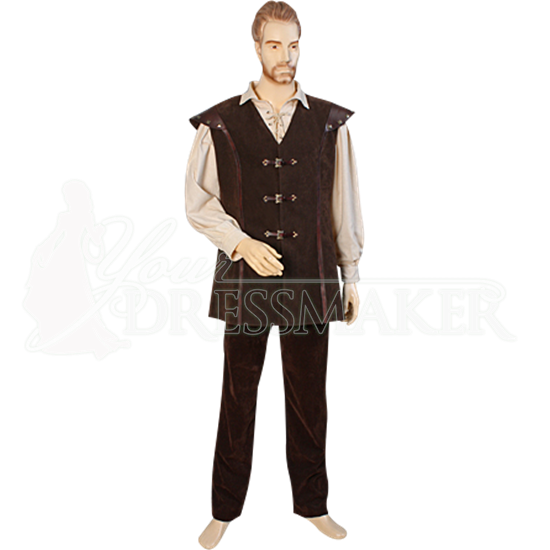 This attractive garment is made from strong, quality materials that allow it to stand up to considerable and rigorous use. The base of this jacket is made from a soft suede fabric. Thick and heavy, this fabric has the strength and resistive qualities necessary to act as fully functional outerwear. Three leather and metal buckle closures line the front of the jacket. Real leather acts as an accent for the shoulders and as trim for the jacket. The leather on the shoulder is further decorated by metal studs. The Medieval French Jacket features an interior lining, which helps to make the jacket more comfortable to wear while also adding another layer to the garment. The jacket is available in several different colors. During the cold months, it is hard to beat the Medieval French Jacket. The thick suede fabric helps to keep you rather warm. And even during the warm months, the Medieval French Jacket does quite well under the rugged stresses of constant hard activity. When ordering, the first Color dropdown menu is for the main color of the jacket. The Accent Color is for the leather trim.